I’m not sure of the reasons why Google took this feature away, but luckily it is very easy, with the help of a Chrome app, to bring it back! Once the app is downloaded and installed the options page will be opened in a new tab (you can also get to this screen from the Google homepage – the link in the bottom left of ‘Choose a background image’ will be returned!). You are then presented with 3 main options to give the app an image to set as the Google Home background, either ‘Image URL’, ‘Imgur’ or ‘Flickr’. I personally think the ‘Image URL’ option is the easiest way to set the background image – I usually use an image from a Picasa Web album so the link is easy to get. I hope this helps you bring back your background image! 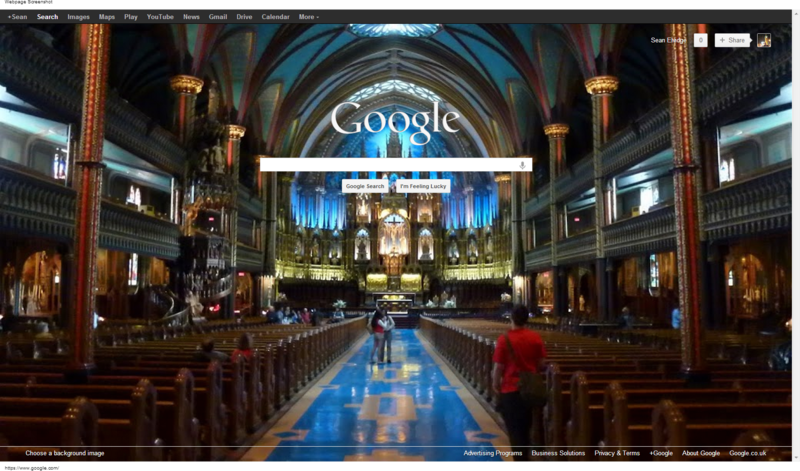 This is my background – from the Notre-Dame de Montréal Basilica. A really beautiful building in Montreal, Canada. This entry was posted in Google Feature. Bookmark the permalink.